If you prefer something neutral in your living room yet cozy and an eye catching then Simmons 5159 might be for you. Elegant transitional style with soft lines brings a mixture of classic and contemporary furniture. 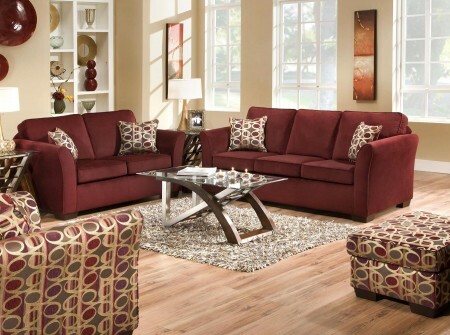 This collection is upholstered in a Wine Malibu color durable fabric with matching accent pillows included in the set. Sofa and loveseat offer spacious seats, semi attached box backs and welted flair arms. Living room set stands on a bold dark brown finish legs that are padded to protect your floors. 5159 sofa and loveseat are also available in two other colors, Malibu Mink and Blue with a chair ottoman and queen sleeper options. It is proudly made in USA by Simmons upholstery, a home made manufacturer brand that offers high quality furniture. Sine they also specialize in mattresses like Beauty Rest and other luxurious models, a queen sleeper includes a comfortable quality mattress. High quality sofa bed mechanism is easy to use and will last for many years to come along with durable construction of the whole set.